Are Urban Cities an Opportunity for Independent Grocers? There has been much talk about the increasing urbanization of the U.S. population in recent years. According to the Census Bureau data, the population of metro areas increased by 2.3 million people from 2012 to 2013. Much of the city living trend can be attributed to young professionals and Baby Boomers who are moving into cities after retirement. While supermarkets have primarily focused on the suburbs, it’s worth asking whether or not this new shift suggest that supermarket operators might have an opportunity to locate stores in core urban areas. In some major cities, new stores in the urban core are increasingly commonplace. That’s certainly the case in San Francisco, Chicago, as well as Washington, D.C., Boston, and other coastal metro areas. Yet urban supermarkets are still not widespread – and while no one anticipates that the suburban food store will disappear, should current trends continue, we might see the proliferation of urban grocery stores. After decades of urban population decline and a corresponding increase in suburban density, people are choosing to start out or relocate in cities – and bringing their retail dollars with them. This is especially the case for two desirable segments of the overall population: young professionals and older empty nesters. Roughly two out of every three millennials (born 1982 – 2000) are now choosing the urban lifestyle. According to a Nielsen report, millennials prefer to live in dense and diverse urban areas, where social interaction is on their front door steps. At the same time, aging baby boomers appear increasingly attracted to living in areas where their dining, cultural and entertainment needs are close at hand. Shortly after, Klein’s Family Markets cut the ribbon for its newest store, ShopRite of Howard Park, located in Baltimore, Maryland. Along with offering a wide array of groceries and fresh produce, meat, seafood, a fresh bake shop, natural, organic and gluten-free products and a full-service pharmacy, the 67,000-square foot store will bring 250 new jobs to the area. It was long thought that the move to the suburbs would characterize population trends into the foreseeable future. 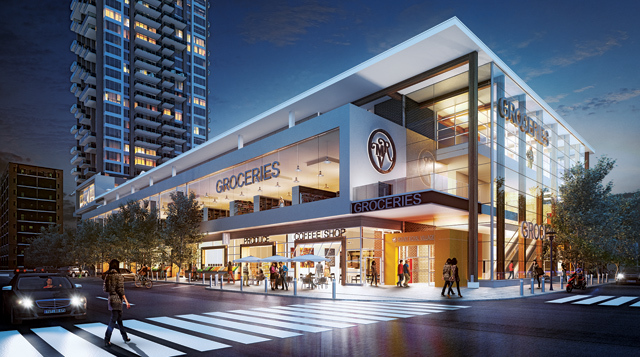 Now, it appears, there may be opportunity for grocery operators to reach consumers who want to sink their roots in the heart of the city. Whether opening a store in a suburb, a rural area, or a revitalized urban area, independent grocers are true entrepreneurs, always looking for the next opportunity. Having the ability to quickly adjust their business model, including size and product mix, to meet the needs of the community they serve is their competitive advantage.